PUT RELAXATION FRONT AND CENTER. 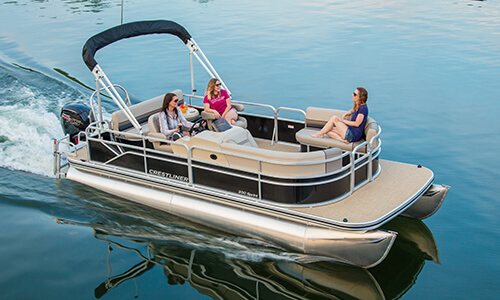 Crestliner pontoon boats are built to elevate any day spent with friends and family. With the Rally DX, Rally, Sprint, and Chase series, there is a pontoon option for every boater. And with multiple floorplans for fishing and cruising across each lineup, you have your choice of configuration to fit what you like best. Each pontoon is built to maximize every moment on the water, and with multiple options, there is a boat for you. The Rally DX is our most premium pontoon designed to make every trip on the water as comfortable, capable and relaxing as possible. High-end features and finish make it a standout choice. 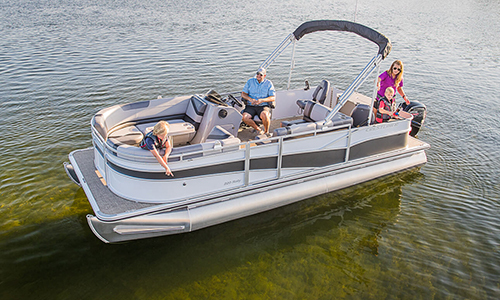 Packed with smart recreation and comfort features, the Rally is a highly-capable pontoon available in a variety of configurations to suit the exact needs of a family on the water. The Chase is a highly versatile pontoon designed to meet your exact needs on the water. A fully-loaded helm comes standard, while multiple layouts and feature options make it an exceptional value. Impressive value is found throughout the Sprint series. Open floorplans and functional features make it a great choice for families seeking a new way to enjoy the water. When you lock-in on a Crestliner pontoon, you have the option to choose from a variety of floorplans to fit your interests. From cruise options, to fishing layouts, the perfect pontoon for you is in reach. If you’re an angler who likes to bring a lot of company, or an avid entertainer who loves gathering big groups and taking them on the water, there is a boat for you. 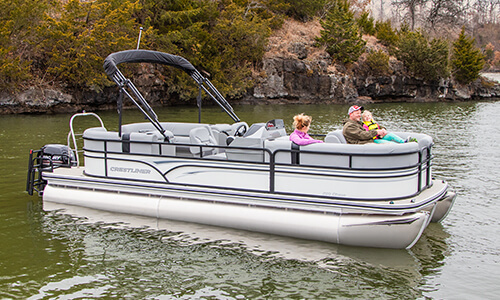 Every Crestliner pontoon comes with furniture that offers comfort and versatility, ample storage, drink holders and enough space for you to bring family and friends. Whether you’re choosing the fish option or the cruise option, every inch of our pontoons are imbued with quality and comfort in mind so you can spend as much time as you want out on the water. Some pontoons are built for comfort, not for speed. Crestliner’s are built for both. 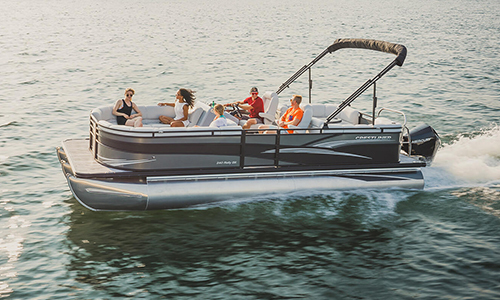 Choose to add a third toon to some of our pontoons and experience unmatched control and power. With exceptional handling and agility, as well as more horsepower and an optional towbar for skiing, tubing and wakeboarding, you’ll be able to enjoy any watersport. Or, if you want to fish, you can find your ideal fishing spot and drop a line from the comfort of one of our fishing seats. Every option is within reach. Crestliner’s pontoon tubes are reinforced with a fully-welded seam holding together the high-grade aluminum that creates an incredibly strong bond so you don’t have to worry about punctures. With crossmembers that are optimally spaced on the riser brackets to provide support on weight-bearing loads, you’ll have a rock-solid platform. Add in the marine-grade deck premium features, and you have a pontoon that you can use to enjoy the water for generations to come.